Aside from proficient technical skills, riding a motorcycle requires the rider to prioritize, focus and pay attention to detail. The rider who has long-term success in arriving safely prepares for the ride, then while in the saddle, takes in only what is needed for the present. We are overloaded with sensory inputs, receiving many more signals at any one time than we can process. From one who knows, it’s easy to get distracted. Whether your mind worries about something down the road that may never materialize or gets caught up in painful memories, that clutter clouds thought processes and usurps precious energy. The vulnerability of a motorcyclist makes prioritization and focus an absolute necessity. Those same skills benefit non-riding activities. Confirm your goal. If you don’t know or care where you’re going, “Then it doesn’t matter which way you go,” said the Cheshire Cat in Alice in Wonderland. 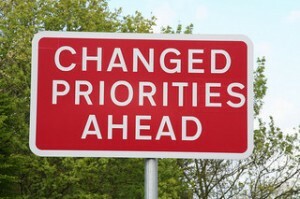 Clear, realistic goals are the essential first step against which to base priorities. Make a list. Write down your overall goal, then the sub-goals that fall under it. These will be holistic, including time for body, mind and spirit.It clarifies that what’s on your list aligns with your goals. If something is out of scope, then nix it. Ironically, when you write it down, there’s often not as to do as your overloaded mind leads you to believe. Assess risks and consequences. During a recent long-distance trip, I kept a closer than usual eye on my tire tread. I wanted to cover 4,600 km (3,000 miles) in a given time period and hoped I wouldn’t have to replace the tires along the way. I was quite confident they’d last, but the potential consequences of riding on worn-out tires meant more frequent checks. Be realistic. Be honest with what you can get done in a day, considering your skills, time constraints and inevitable unplanned events. I know that if all I want to do is cover distance, I can easily cover 1,000 km. in a day. But if I want to do it in daylight, stop at points of interest, take scenic back roads and arrive still energized, traveling that distance is out of the question. Plan and prepare. Be proactive rather than reactive, without over planning. Cover the priorities – i.e. tentative route, maintenance, points of interest, gas stops, but leave room for serendipity. It gives you peace of mind, saves a lot of time and makes whatever you’re doing more enjoyable. Be organized. Before you start your day, establish that you’ve got the resources necessary to achieve your goals for the day. Beginning your day with a full tank of gas, checking your tires for wear and air pressure allows you to put those things out of your mind and leaves room to focus on other things – like road conditions and scenery. Be flexible. There’s a saying that there are two plans for every day; your plan and the Universe’s plan for you. Sometimes they’re the same; often they’re not. When things don’t go as planned, roll with it. Reassess the situation and move off from where you are. Ask for help. If you’ve pared everything down and still have too much coming at you, ask for help. You weren’t put on this earth to be chronically exhausted from taking on too much. Others are standing by ready to help, waiting to be asked. Say No. There are so many things you could enjoy doing but you can’t do them all. Sometimes you have to say “no” and catch them on the next trip around. Prioritizing your inputs helps you stay focused, promotes safety and frees up time, not only to complete tasks, but also to enjoy the journey. Taking these steps before setting out, frees your mind of clutter and worry. There’ll be enough inputs to process while you’re riding. Thanks Liz these are very important items to think about every day. I have to read them myself as a reminder! Thanks Mary.